If you’ve ever found yourself face-to-face with scary shadow people, know you’re not alone; tons of stories exist online about these freaky entities and the process of summoning a shadow person. The term “shadow people” first appeared in 2001, although some say these spooky silhouettes trace their roots back to early man. Regardless of exactly who or what these shadowy spirits are, shadow person stories litter the Internet, suggesting this phenomenon happens to people from all walks of life. While the beings themselves remain difficult to classify, the process of how to summon a shadow person is actually pretty easy, as long as you have the proper tools and mindset. The act of inviting a shadow person requires a different set of rituals than those used for contacting the dead. Though they possess similar haunting qualities of ghosts, shadow people are likely another form of supernatural phenomena. According to some reports, shadow people are the leftover energy of the dead that somehow remain stuck in the mortal realm, while another theory posits that shadow people are astral projections. Thankfully, their origins mean little in regards to summoning them, meaning all you need to do is adapt a negative attitude, light some candles, put up some mirrors, and wait for the room to go cold. Though negative energy brings out the worst in normal people, it also brings out shadow people, making it a key ingredient for your summoning purposes. To see the entity known as the Hat Man, though, you need a special type of negativity. Members of a dysfunctional family are the most likely to encounter Hat Man, especially during periods of strong emotional upheaval. 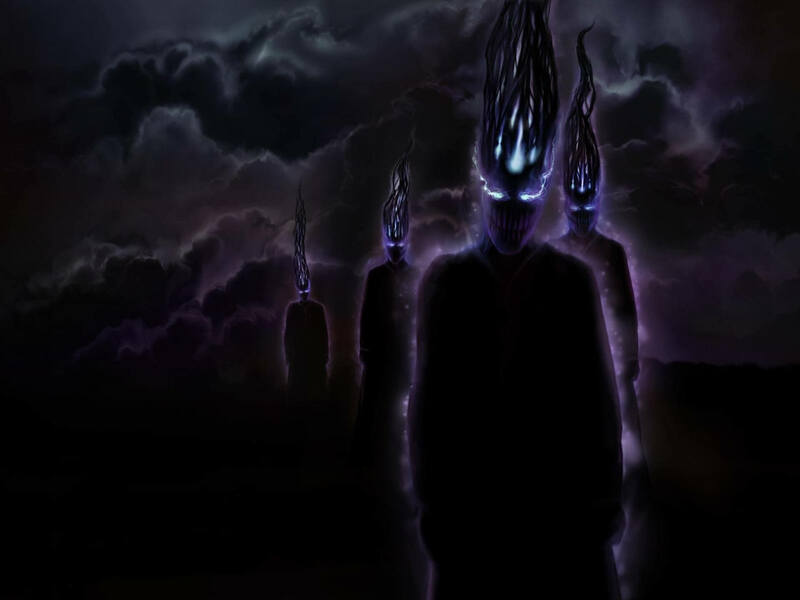 Duncan Connor, who runs a website dedicated to the shadow being, describes his own run-in with the Hat Man, and how it also appeared to other members of his family. In other words, if you and your spouse start fighting a lot, it might lead to an appearance from the Hat Man. This shadow person tends to stick to basements, so be sure it looks dim and full of cobwebs for the Hat Man’s debut. A relatively easy spell used by shadow witches helps you connect with a shadow person. The setup for this ritual requires few supplies: an empty room, crystals, and black candles. Light the candles before picking up a crystal, then sit down quietly in a corner. Close your eyes, focus your energy on making contact, and literally push your hand out until you feel the temperature drop. As their whispers and dark figures form in your mind’s eye, focus your energy towards them as a means of attracting their attention. At this point, it’s believed you’ve made contact with a shadow person! Ask it for assistance, but prepare yourself to quickly drop the crystal, open your eyes, and blow out the candles if anything goes wrong. If this fails to work the first time, you could always turn to a shadow witch for assistance. Some believe djinn and shadow people are the same thing. Therefore, a djinn summoning ritual like the one above may enable you to call forth a shadow person. To begin, arrange a ritual table with a candle on each corner along with a mirror, a wooden bowl, natural stones, a solid silver ring, and a piece of paper containing the symbol of the exact djinn, or shadow person, you wish to summon. After setting everything up, pour salt water into the bowl, light your candles, and then allow yourself to enter into a meditative state where you may focus solely on invoking the djinn. Numerous phrases can summon the djinn, but the most important thing is to offer an invitation and concentrate on bringing the djinn into the room. Be aware you may revoke this invitation at any time by blowing out the candles and telling the djinn to leave. During the chanting, it is imperative for one member of the group to knock on the door between the summoners and the person waiting to commune with the shadow person. Each knock gives the shadow person an hour in your home, so don’t get overly zealous and knock too many times. If all goes well, the shadowman will appear in the mirror. Mediums often cleanse rooms or even entire houses after reaching out to the spirit world. Some believe failure to follow this protocol leaves the portal open for malevolent entities to slip into the human realm. Certainly a terrifying prospect, this also gives you a vehicle to bring shadow people into your life. Simply allow a medium to make contact with ghosts and then ask them to leave without completing their cleansing ritual. With any luck, you’ll soon spot a shadow person. Shadow people appear most frequently during moments of emotional duress. Therefore, allowing your negative energy to flow is a good way to call them. Of course, dwelling in negativity, while great for conjuring the supernatural, is not great for your state of being, so consider your health when you undertake this. If you want to ask a shadow person to reveal themselves, though, feeding them with negative energy marks a good place to start. To those of you incapable of seeing shadow people, perhaps take comfort in the fact that the energy around you is too positive for their liking. Do shadow people already take up residency in your home? To get them out of your home, a common solution is to simply ask them to leave. But as is the case with all quick fixes, sometimes they go horribly wrong. At least one report tells of a person demanding the existing shadow people to leave, only to inadvertently summoning a much more powerful shadow person instead. If you truly wish to introduce shadow people into your life, this mishap may sound less like a problem and more like a prospect. Therefore, if you want to see a greater display of power, you can try asking other shadow people to go away. Taking the route of asking or pleading with the shadow people instead of commanding them to leave may bring you the most success. Shadow people, just like regular ones, enjoy pleasant business transactions. The TV show Adventure Time features many supernatural references, including Shadow Slender Demons who can’t enter a dwelling blocked by a salt barrier. In one episode, they present an extremely easy way to contact a shadow person. Simply place a jacket over a chair, put the chair in an easily visible spot, and turn off the lights. Try to fall asleep after completing your prep work, and the shadow person – or your imagination – will take care of the rest! While it seems more like a mind game than supernatural manifestation, remember shadow people sightings largely depend on your mental state. So if you start “seeing” shadow people in your head, they may just feel inclined to start appearing to you in real life. Do you suffer from sleep paralysis? This horrible condition leaves people temporarily unable to move. However, those who desire to see a shadow person might just benefit from sleep paralysis. Even among the scientific community, consensus exists that sufferers of this sleep disorder actually see shadow people. Of course, researchers also claim this phenomenon is nothing more than a hallucination, but as stated before, the mind provides shadow people one of the quickest gateways into the tangible world. Encounters with shadow people tend to vary just as much as those with ghosts. Therefore, it’s possible one shadow person may serve a very beneficial role while another may simply do malicious things. Reported shadow people encounters indicate they all boast a form of intelligence and are fully cognizant of their actions. In more gruesome instances, encounters end with people suffering cuts, bruises, and emotional turmoil. Meanwhile, a nice shadow person could conceivably offer companionship or perhaps even help you prank or scare someone else. No matter what you wish to do after summoning one of these spirits, never forget they remain in control their actions, not you, and therefore caution needs to be utilized when dealing with them. Attracting a shadow person is best done through negativity or sleep paralysis, although asking them to appear may work. Once they arrive, you might find it difficult to convince them to leave. This is the primary reason why it’s best to set a visitation time limit from the very beginning. If this fails, firmly tell the shadow person they’ve overstayed their welcome. Be sure to extinguish any lit candles and cover up any mirrors. You’ll also want to cleanse the room with sage to prevent shadow people from lingering or coming back.